We are experts in driving end-to-end supply chain performance. Whether we look at this as from cradle to grave, from creation to customer, from inception to reception, from concept to cash or from significance to service, the key is how to simplify the complexity of the supply chain to drive performance. Our proprietary process for how we achieve these results, our TST Process, focuses on the 3 factors that drive the preponderance of success. What Differentiates Our TST Process? The TST Process simplifies through the 1000’s of priorities within the end-to-end supply chain to just three key elements. Torque – how to get out of the blocks rapidly to achieve quick wins and gain momentum. Our most successful clients find opportunities for these wins early – and frequently. Speed – in today’s Amazonian world, speed rules! Do you want to be driving the Yugo in the slow lane or speeding by in the Audi A5 Convertible? 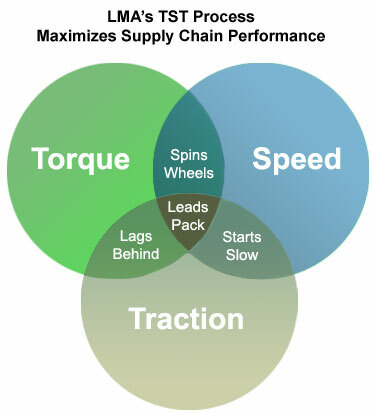 Traction – how to maintain control of the critical success factors for supply chain success. Even if you are driving in the fast lane in an Audi A5, if you cannot maintain control in inclement weather or when a dog runs out into the street, nothing else matters! TST combines torque, speed and traction in the “right” combination to drive superior supply chain performance. Any one or two of these factors alone isn’t enough! We find that organizations often have several initiatives in place; however, results can fall apart if the right mix isn’t achieved. Spin your wheels – If you have torque and speed but not traction, you’ll spin your wheels. Unfortunately, this is a common occurrence – time and resources are wasted. Instead, we design your people, processes, systems and financial metrics in concert and in alignment with strategy to add control into the equation. Slow start – If you have speed and traction but not torque, you’ll have a slow start. This is one of the worst outcomes in today’s Amazonian business environment. Getting out of the blocks quickly can make or break success. Lag behind – If you have torque and traction without speed, you’ll lag behind. Certainly, this is not a recipe for success! If there is one factor in common across ALL of my clients, from small closely held businesses to multi-billion dollar, global enterprises, spanning many industries ranging from aerospace to food and beverage to distribution, it is that SPEED has become a “must” for success. 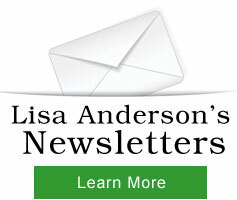 "Lisa is very detailed oriented but also has the ability to keep her eye on the “big picture”. Her knowledge and experience in all facets of supply chain management are exemplary. 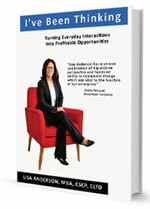 She exceeds her clients' expectations and delivers measurable, bottom line results."